No matter how much I travel, and how useful they have proven in the past, I still cannot fully embrace the roller bag. I like a bag I can throw over my shoulder after stuffing it with a few changes of clothing and maybe an extra pair of shoes. 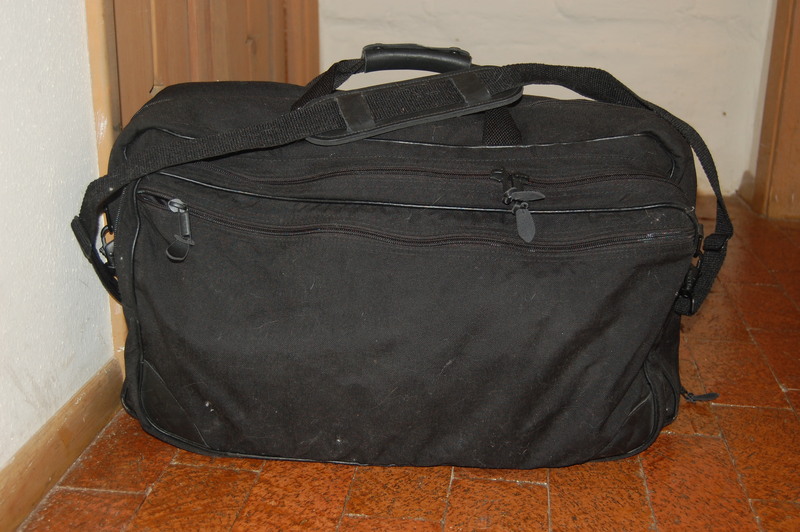 I like to think that this kind of bag keeps me from over-packing, which is easy to do with a roller bag since its heft is offset by the physics of wheels. So when I decided to fly to New Mexico to visit L in her dissertation purdah a few days I knew which bag I would take. I bought this soft-sided L.L. Bean suitcase back in the 1990s and it has been around the world with me. It’s not huge, but I can comfortably carry a week’s worth of clothes — even a suit in its own button-in bag — without putting too much strain on my shoulder. The books shown are optional, but I always leave room for reading material. This entry was posted in His, New Mexico, Travel and tagged l.l. bean, postaday2011. Bookmark the permalink. I’d like to think I am good at the pre-pack — deciding what to take and what to leave behind. The trick is picking a smaller bag than what you really want, then letting the size of the bag make the decision for you on what should stay and what should go. I’m always on the look-out for the perfect footwear that would be able to meet all of my needs, but try as I might I can only narrow it down to two or three choices depending upon the dictates of my trip. 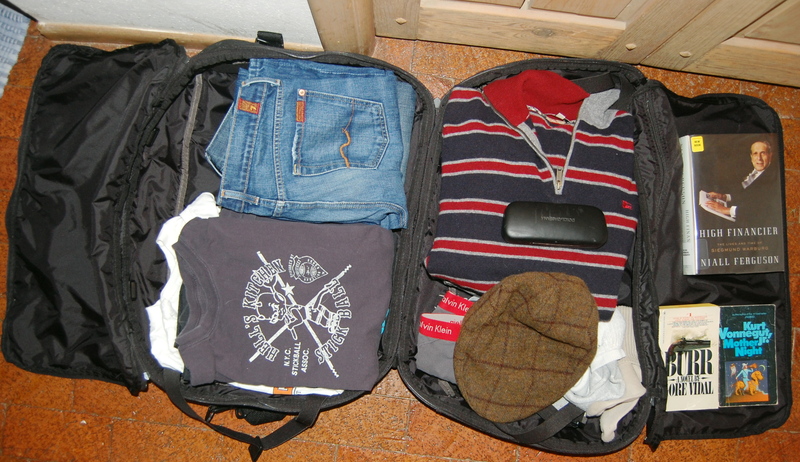 i always used to take such pride in being able to pack light, and because of it, i too disliked suitcases with wheels. i always thought, nah, i wanna just sling it over my shoulder and go. so i can definitely understand your sentiment. I can understand how shoes can quickly add to the weight of your bag. Usually what I will do is wear the heaviest pair of shoes on the plane with me and pack the light ones into the bag after stuffing them with socks, ties, and underwear. You definitely want to avoid the nightmare of the handle break. It’s not fun for anyone especially when you have to get from the international airport in Mumbai to the airport serving the domestic destinations and the only transportation is a crowded bus. This was the scenario of my handle break and I wouldn’t want to relive that nightmare. You are more than welcome for our support. Enjoy reading your blog. Keep up the good work!